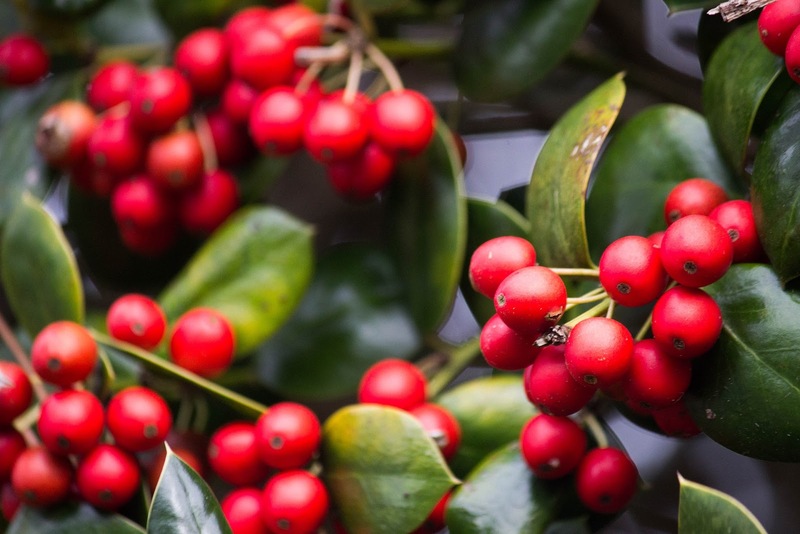 During the holidays, the staff at Annapolis Valley Regional Library will be taking time to spend with family and friends. There will be some exciting changes coming to AVRL in the new year. We are retiring the Feed Your Mind blog. Look for us at renewyourcuriosity.ca in January, 2017. We are excited about what we will have to offer you, so stay tuned! It has been our pleasure to serve you during the past year, and we are looking forward to seeing you all in 2017. HAPPY HOLIDAYS! BEST WISHES FOR THE NEW YEAR!! 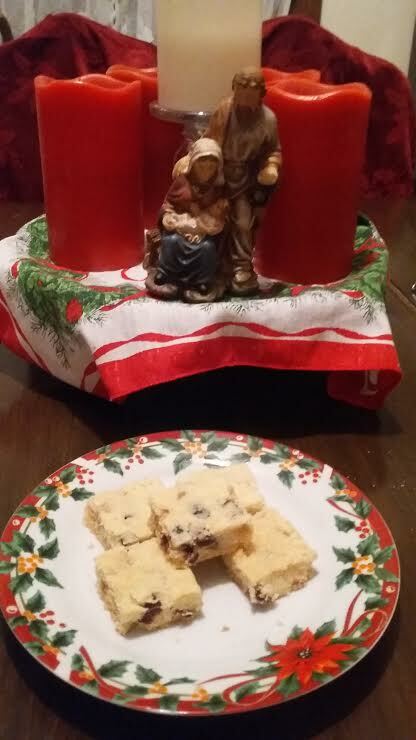 Our friends are in the 12 Days of Cookies spirit. 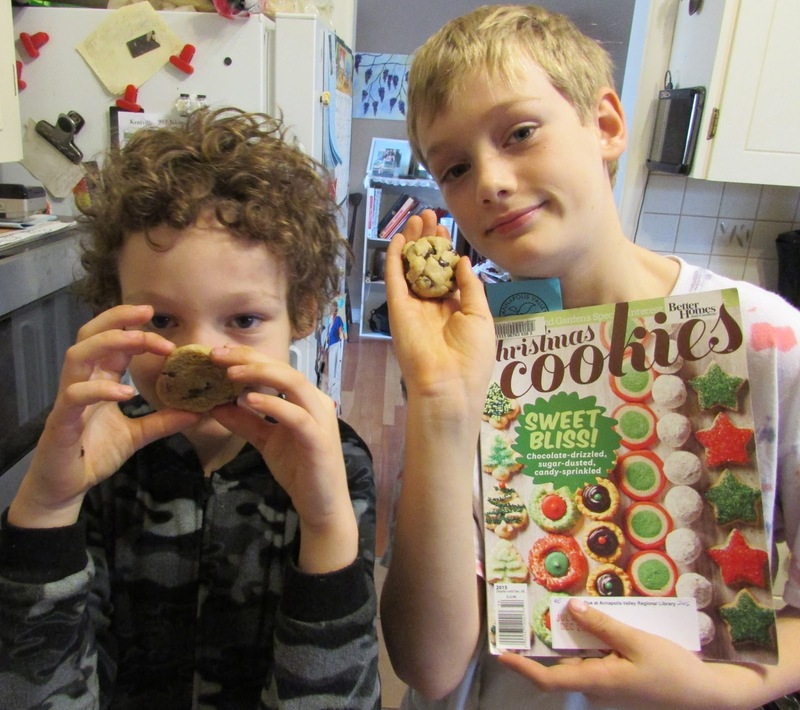 Daniel and Thomas Duke sent in these pictures of them baking Basic Chocolate Chip Cookies from the Better Homes and Gardens magazine Christmas Cookies. 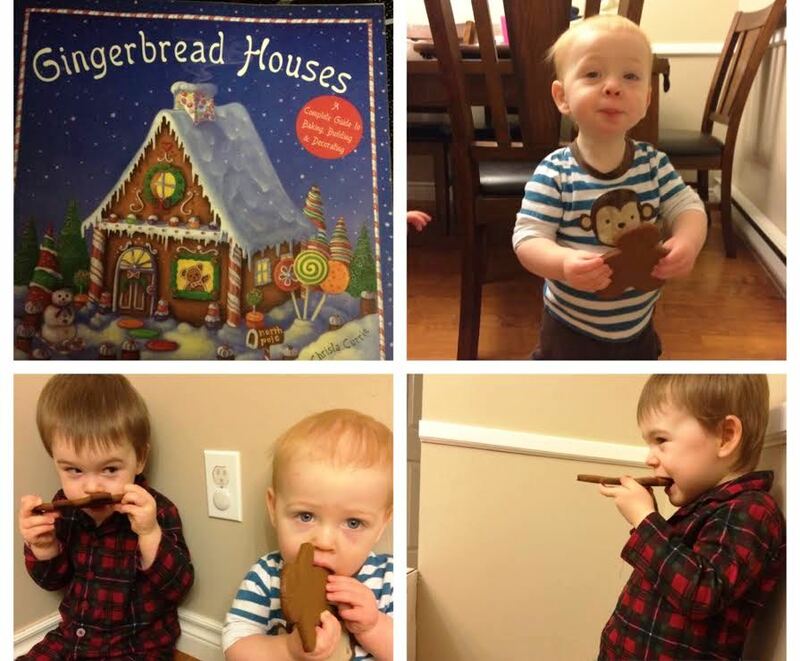 Katie, Evan and Ryan Pitt will be constructing their gingerbread house on Christmas Eve, made from Gingerbread Houses by Christa Currie. It looks like some of the gingerbread men may not survive the wait! 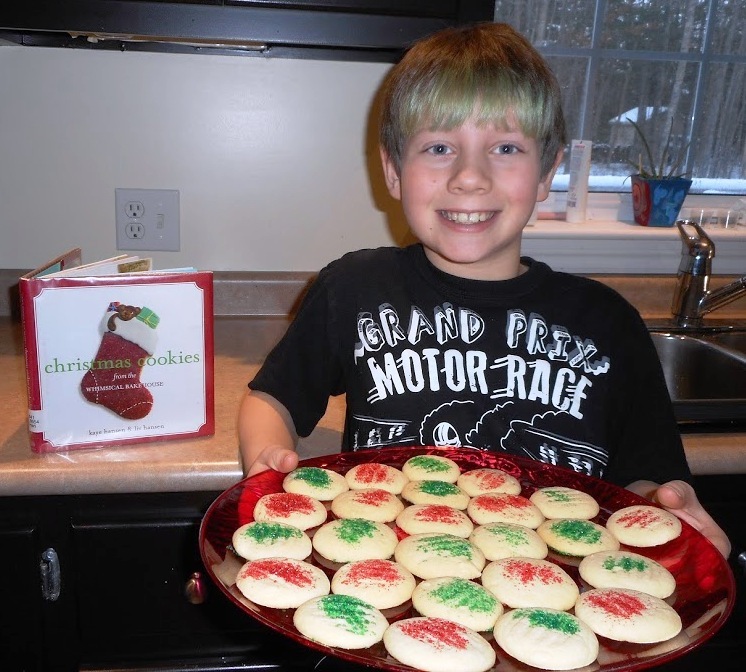 Wyatt Boyd didn’t need any help, (maybe a little with the oven), making Creamy Christmas Butter Cookies from Christmas Cookies From The Whimsical Bake House by Kaye Hansen and Liv Hansen. And the winner of the ‘Cookie Gift Bag’ is Kim Boswell! Congratulations Kim, and thanks to everyone who entered the contest and for sending in the great pictures. Look for us in 2017 at renewyourcuriosity.ca!! Today's cookies were made by Sandi Troop and can be sampled at the Annapolis Royal Library. I have participated in the 12 Days of Cookies several times. 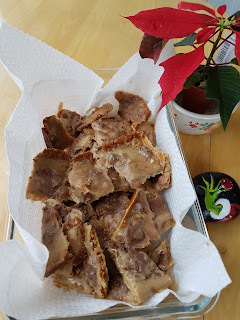 Two or three times I resurrected recipes I used from library books when my kids were little or recipes that looked like ones I could make well in advance. 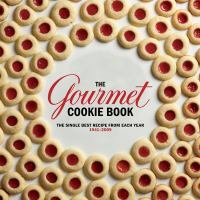 This year I wanted one that just intrigued me to try...and I found it in The Gourmet Cookie Book: The Single Best Recipe from Each Year 1941 – 2009. Who doesn’t love ginger, a lot? 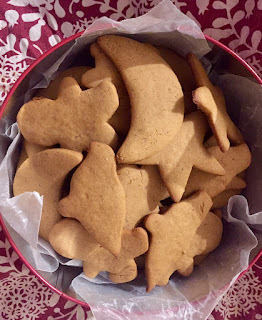 Who doesn’t love shortbread, a lot? You know that shortbread cookie covered with toffee; are you drooling yet? This recipe responds to the above questions but takes them in a new direction. The shortbread base is really thin and not very sweet but the ginger toffee-like topping is easy peasy to make and tastes a treat. 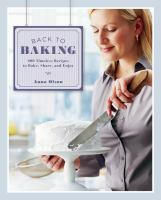 With 1 cup icing sugar it is a sweet part to the cookie, making a perfect contrast to the thin, crisp shortbread base. Initially I thought I could get Lyle’s Golden Syrup at the local grocery store but when I went in to get it they didn’t have it. A quick Google search recommended substituting 2 parts corn syrup with one part molasses. Since the recipe only calls for 1 Tbsp in the topping I thought this would work. As far as I can tell it did; Skibo Castle Ginger Crunch is delicious! Sift together dry ingredients and blend in butter with your fingers until mixture resembles coarse meal. Press evenly into bottom of pan (base will be thin). Bake in middle of oven until golden and crisp, 20 – 25 minutes. Melt the butter in a small saucepan and whisk the remaining ingredients until smooth. Bring to a boil and simmer, stirring 30 seconds. 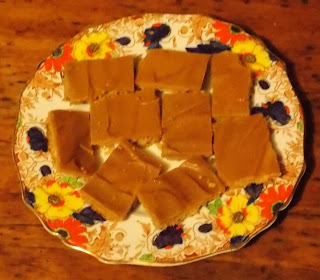 Remove shortbread from oven and pour topping over, tilting pan to cover shortbread evenly. Cool in pan on rack, then cut into small rectangles 8 by 8 or for larger cookies 4 by 9. It breaks easily when cutting into pieces. I think the solution would be to use a very thin, very sharp knife. Finally I have been on a low carb/ high protein diet the last 4 months. I cheat, with little remorse occasionally. It helps me stay in control and choose my treats more wisely. With the Skibo Castle Ginger Crunch I was absolutely NOT in control. I had to pack the remains up and put them in a tin out of the way quickly. Even that did not prevent me from sampling them again this morning. (Only 1 though and carbs in the morning are not as bad as carbs in the evening; plus I cut the cookies small). Made by Sue Mosher, Bookmobile, from Almost Too Cute to Eat, one of the great children’s cookbooks in our collection. Come visit the Bookmobile today in Brooklyn and Summerville for a sample. In a medium mixing bowl, beat butter and sugars on medium speed until well blended. Beat in egg; stir in vanilla. In a small bowl, stir together flour, baking soda, salt, and cinnamon; add to butter mixture, blending until incorporated. Stir in oats until blended. 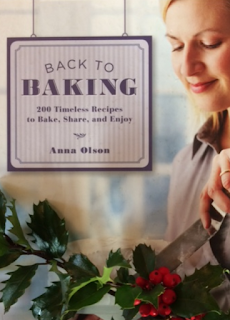 I love finding a recipe in a picture book! 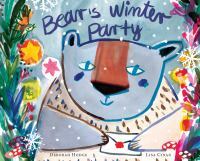 Here’s a story of a lonely bear who invites the forest animals for a party. 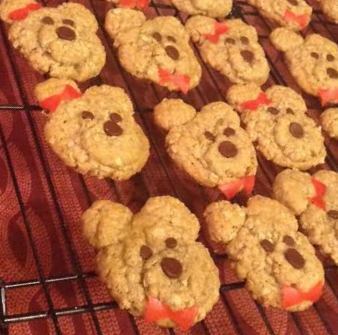 He bakes cookies for them, but then thinks they won’t show up because they are afraid of him. But of course, they do show up, and they eat cookies together. There’s another great cookie book out this year, The Cookie Fiasco by Dan Santat, but it does not have a recipe in it. However, it is a great book to help teach fractions, so borrow both of these books, make some cookies, invite some friends over, and do some math. 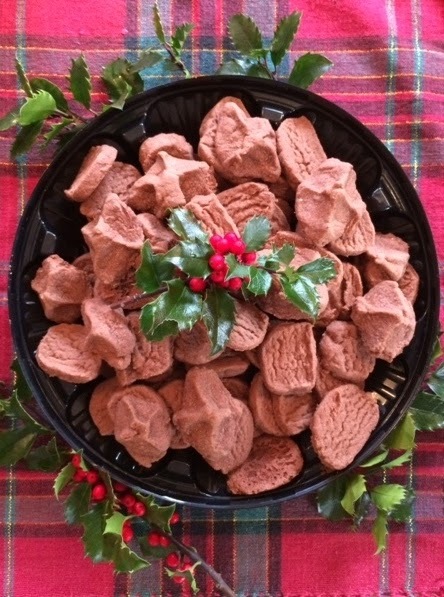 You might as well add in The Doorbell Rang by Pat Hutchins for the perfect cookie day. Add the flour mixture to the creamed mixture, beating in as much as you can with the mixer, then stir until it is well combined. With your hands, form the dough into a ball. Roll the dough 1/4 in thick on a lightly floured surface. Use your cookie cutters to make cutouts, then place them about 1 inch apart on greased cookie sheets. 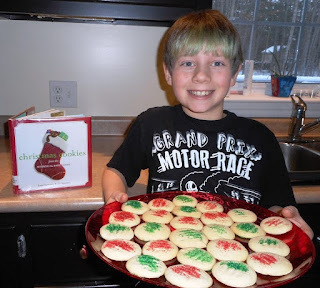 If you like, decorate the cookies with candies, sprinkles, raisins, or chocolate chips. 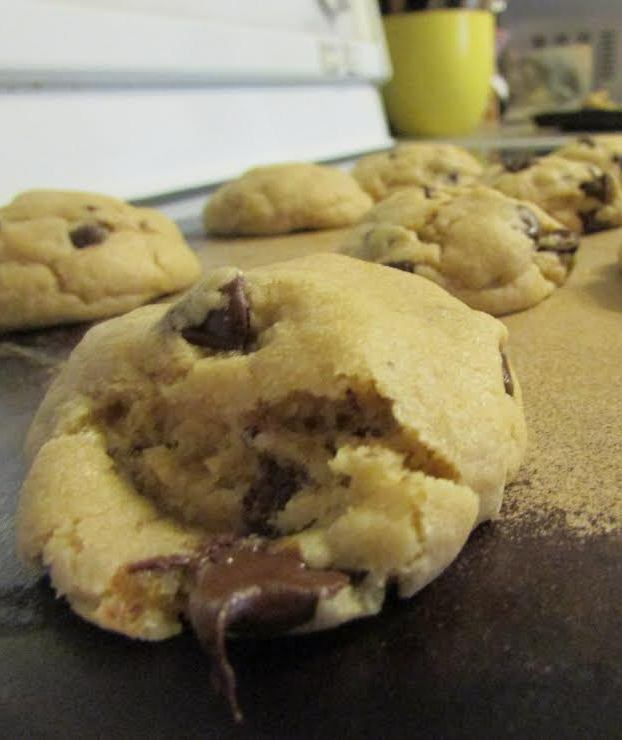 Bake at 350 degrees for 8-10 minutes or until cookies are firm around the edges. NOTES: I found the dough to be a little sticky, and had to use a heavily floured surface and re-flour the rolling pin several times. These are not very sweet; they are a good afternoon cookie with a cup of tea. I also found them to be less gingery than I prefer so would add a bit more ginger to the recipe, or perhaps some fresh grated ginger. NOTE: DUE TO THE WEATHER, THESE COOKIES WILL NOT BE AVAILABLE TODAY. ALTERNATE STORM DAY IS WEDNESDAY, DEC. 14. Middleton branch manager Sue Aldred made these yummy shortbread cookies from a recipe found in the December 2014 issue of All-Recipes magazine. Drop in to the Rosa M. Harvey Middleton and Area Library today for some warm smiles and a cookie. Whip butter until fluffy. 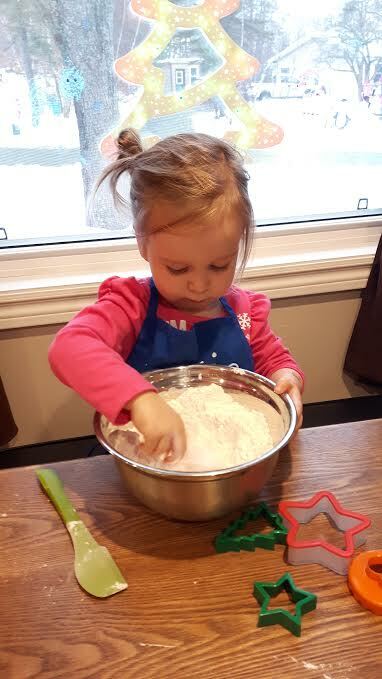 Stir in icing sugar, cornstarch, salt, and flour. Beat on low for one minute. Add vanilla and beat on high for 3 to 4 minutes. 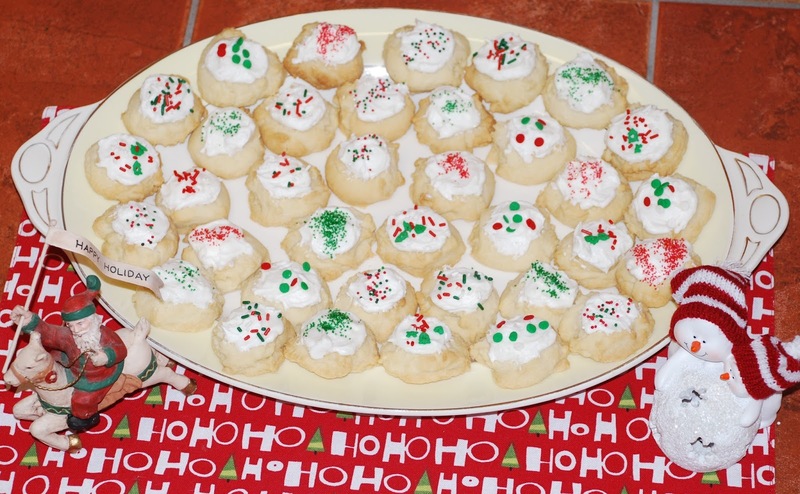 Drop cookies by spoonsful 2 inches apart on an ungreased cookie sheet. Ice with almond icing and decorate with sprinkles or chopped cherries. Yield: 4 dozen small cookies. Andrea Leeson, manager of the Kingston branch, donned her baker's cap to whip up these dainty treats from Back to Baking: 200 timeless recipes to bake, share, and enjoy. These cookies have a chocolate intensity that balances with their buttery richness, and when piped onto a baking tray, they look like chocolate kisses. Preheat the oven to 325 degrees Fahrenheit (160 degrees Celsius) and line 2 baking trays with parchment paper. Cream the butter and icing sugar together until smooth. Beat in the vanilla extract. Add the flour, cocoa, cornstarch, and salt, and beat until evenly incorporated. Spoon the soft cookie dough into a piping bag fitted with a large plain tip, and pipe 1” (2.5 cm) “kisses” onto the baking trays, leaving a 2” space between the cookies. Bake the cookies for 12 to 14 minutes, until they lift away from the parchment paper without sticking. Let the cookies cool completely on the tray before removing. The cookies will keep in an airtight container for up to 3 days. 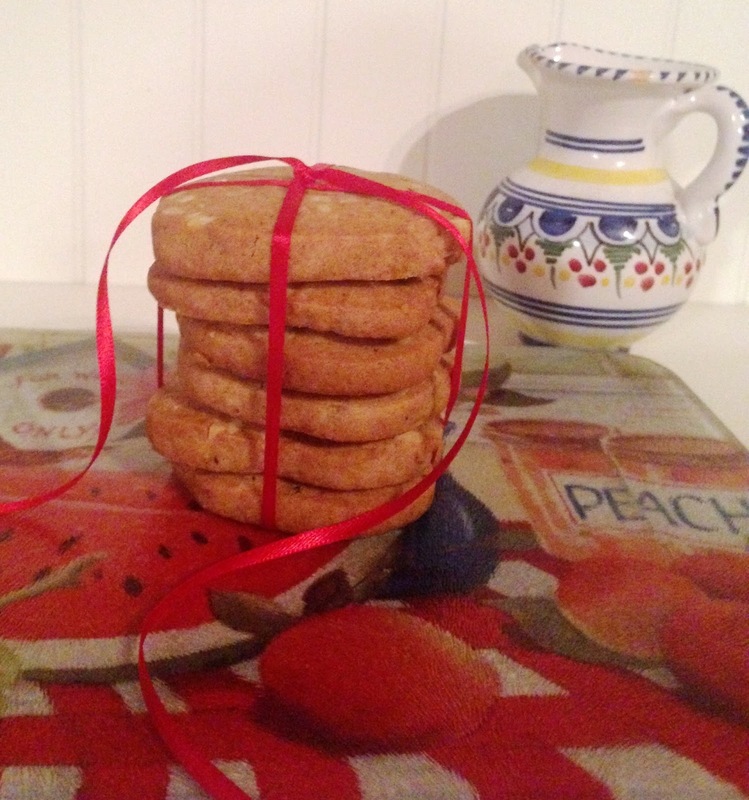 DON"T FORGET: You can ENTER to win a Cookie Gift Bag! !